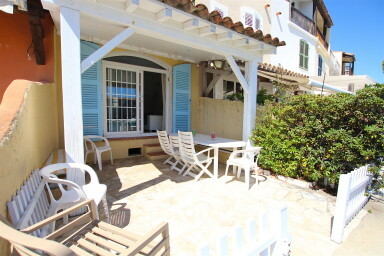 This beautiful fisherman house has been renewed recently and is located in a private area of Port Grimaud 1. Splendid view on the canal and the entrance of the harbor. On the street space, a large green area where children can meet and play. On the ground floor, a living-room and a kitchen. On the first floor, 1 bedroom with a double bed, 1 bedroom with 2 single beds (can be joined to make a double bed) and one shower-room. On the second floor, 1 bedroom with a double bed, 1 bedroom with 2 single beds (can be joined to make a double bed) and one shower-room. One terrace on the street side and one terrace on the canal side. A 16m x 4.20 mooring.